A very quick post today to sing the praises of a poster created by Photoshop 1 student Rosario. 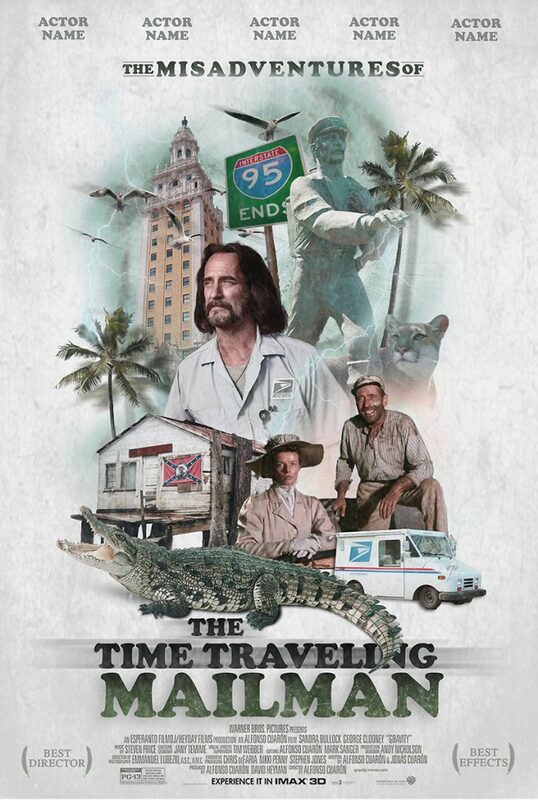 His poster is based on the Barefoot Mailman (a real character beloved in South Florida). Rosario created great flow with the placement of objects on the page. Mixing old with the new. Great use of hierarchy and opacity. And I really enjoy the texture of the paper in the background. As an aside, I have asked him to swap out the Actor Name place holder at the top for his portfolio. It makes it feel “fake” and not a real poster for a client. Do you agree? Does it feel as polished as it could? In the past I have had students use the names of their friends and family or favorite movie stars. Rosario, I believe you have a bright future ahead of you.